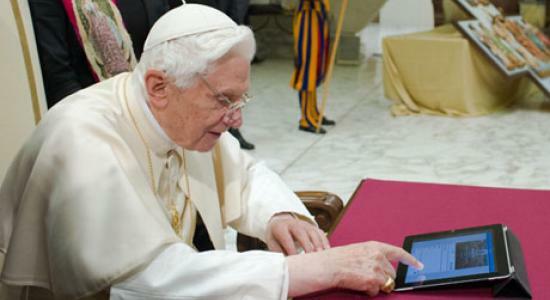 As a milestone in the Vatican’s drive to spread the gospel through social media, a jubilant Pope Francis celebrated reaching 10 million followers on messaging site Twitter. The first non-European pope in 1,300 years has tripled the number of followers of the Pontifex handles since succeeding Benedict XVI in March, according to the Vatican, which announced Francis had reached 10 million after adding together the followers of all his accounts. Publishing simultaneously in languages including Latin, Polish, and Arabic, the pontiff wrote on his nine accounts, “Dear Followers I understand there are now over 10 million of you!”. According to websites this would make the pontiff more popular than the New York Times and just behind rapper Kanye West. Still he is behind in Tweeting the three most followed people on Twitter: pop stars Justin Bieber, Katy Perry and Lady Gaga, who have more than 40 million followers each. With radio inventor Guglielmo Marconi setting up Vatican Radio in 1931, the Vatican has long been interested in using the latest technologies to keep in touch with the world’s 1.2 billion Catholics and spread the faith.